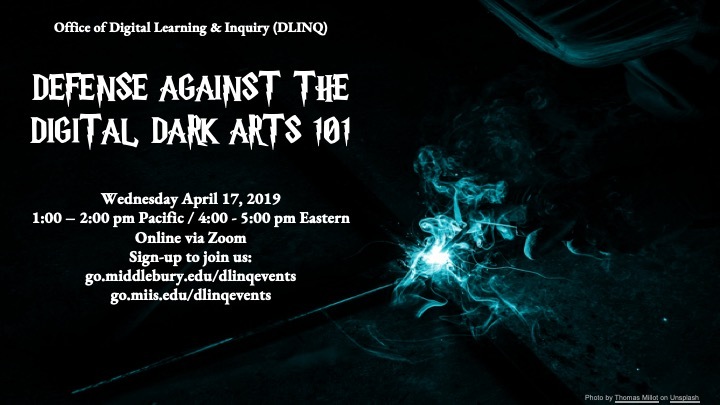 April 17, 2019 | Defense Against the Digital Dark Arts 101: What Is Going On with Your Personal Information? This entry was posted in Midd Blogosphere and tagged For Faculty, For Staff, Midd Points, Midd/MIIS Collaboration on March 29, 2019 by Amy Slay. College students complete the FMS Certificate in Social Enterprise Management and Impact Investing. Pictured left to right: Julien Souffrant, Peter Davis, James Scott, Matthew Lantin, Grant Schultz, and Kwame Mukasa. Photo taken by MIIS graduate student Erwin Alberty (MIDD ’06). 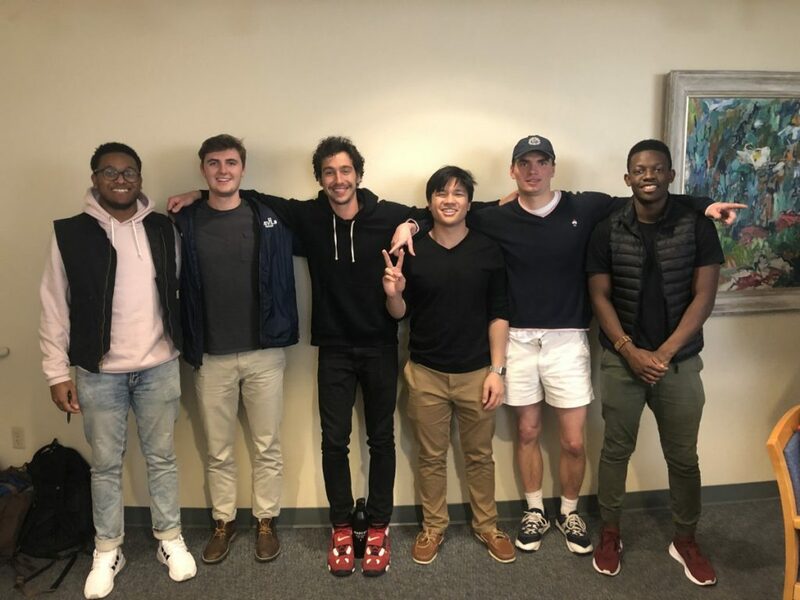 The Middlebury Institute welcomed six Middlebury College undergraduates for the Frontier Market Scouts Certificate in Social Enterprise Management and Impact Investing in addition to five students participating in the Program on Design, Partnering, Management and Innovation (DPMI. This was the largest number of College students to date participating in on-campus Monterey programs during January. This is due to the Frontier Market Scouts program admitting undergraduates from the College for the first time. The College students participated alongside Middlebury Institute graduate students and current professionals in both the FMS and DPMI programs. They were a welcome addition to both programs! This entry was posted in Midd Blogosphere and tagged Midd Points, Midd/MIIS Collaboration on February 14, 2019 by Carolyn Meyer. Greetings! DLINQ staff and interns wish you a happy, reflective and restorative holiday season. This is the final 2018 installment of the weekly “DIRT” from the Office of Digital Learning & Inquiry. In January 2019, the DIRT will transition from a weekly blog post to a monthly e-mail newsletter with DLINQ updates, inspiration, and information about events. Mark your calendars! We are excited to be hosting and co-hosting a number of events as we kick off the new year. January 7th Digital Detox 2019 launches. DLINQ’s second detox series will focus on bias and inclusion in digital spaces. Learn more about the series and consider subscribing to join the conversation with us. The following events are co-sponsored by DLINQ and the Center for Teaching, Learning & Research (CTLR) January Pedagogy Series. Registration for on-ground participation will be open soon. January 17th Join us in-person or via Zoom for a Digital Detox session on Mindfulness & Radical Listening in Digital Spaces. With the help of a number of entrepreneurial students, Bill Koulopoulos, DLINQ Director of Learning Spaces and Technology, has been a key advocate for getting Middlebury’s maker movement off the ground. The space, housed in the Freeman International Center, is referred to by students as “MEME” which stands for Middlebury Environment for Making Everything. MEME offers a friendly community space with a range of fabrication tools from 3-D printers to sewing machines. Early programming like the “Repair Cafe” has been well received and there are plans to expand offerings along with building faculty partnerships to explore meaningful curricular connections. This entry was posted in Midd Blogosphere and tagged For Faculty, For Staff, Midd Points, Midd/MIIS Collaboration on December 18, 2018 by Bob Cole. The Office of Digital Learning and Inquiry (DLINQ) is excited to announce our second annual Digital Detox. In DLINQ, we look holistically at “the digital” in our lives and in our educational environments. This means we examine the promises and the risks of how we use digital tools, how those tools impact various facets of our lives and interactions, and the increasingly blurred edges between physical and digital realms. Digital Detox is an initiative to reduce the toxicity of our personal digital environments and how we engage with them. The theme of this year’s Detox is Inclusion and Bias in Digital Spaces. When you sign up to participate in the Detox, you’ll receive a twice-weekly email newsletter in January and early February with actionable strategies for reducing exclusion, increasing inclusion, and combating bias in digital spaces. Topics include data and digital redlining, radical listening in digital spaces, critically considering tools, confronting the invisible digital divide in higher ed, and more! By mindfully taking on this detox, you will begin to develop critical and healthy habits in digital spaces. Digital Detox 2019 is created in partnership with DLINQ’s Inclusive Design studio. Heather Stafford continues her blog series to dig deeper into some of the small moves that were discussed during her October 25th online workshop ‘Student-Centered Course Design Using Canvas.’ In the series Heather shares activities and design elements that faculty can implement to amplify connectivity of a class. In the forth edition of the series, Heather features the practice of establishing virtual office hours with a combination of Canvas’ scheduler and Zoom web conferencing tools. On Tuesday, December 4th, Amy Collier facilitated a workshop titled “Misinformation & Bots/Sockpuppets” as part of Middlebury’s Digital Fluencies series, co-sponsored by the DLA, CTLR, Davis Family Library, and DLINQ. The session invited participants to explore the following questions: What role do bots (automated fake social media accounts) and sockpuppets (human-operated fake social media accounts) play in our digital information environments? How do you spot a bot or sockpuppet and try understand their influence? How do human, non-human and hybrid actors infiltrate our digital “public” spheres, and how might we combat them? During the session Amy situated the wicked challenge of dis/misinformation within the context of our current digital information sphere which is heavily consolidated among a few big tech companies (e.g. Facebook, Google, Twitter) and primarily driven by their commercial interests. The work of “bad bots” (BTW they’re not all bad) and the goal of active disinformation campaigns is to hack the public’s attention in order to sow doubt, erode trust, polarize, destabilize, and radicalize. Amy noted that while propaganda is not a new phenomenon in the United States, what’s different about what we are seeing today is the massive reach that these forces can have, especially when they are activated in heavily siloed social media platforms accessed by hundreds of millions of people around the world. The impact of coordinated dis/misinformation is even more pronounced as our information spaces have become equated to our personal identities, what we believe, and how we feel. The metaphor of environmental pollution guides Amy’s approach to talking about the effects of dis/misinformation in our lives and is foundational to the work of DLINQ’s Information Environmentalism Studio. Through inquiry and exploration we can move beyond a sense of learned helplessness about the toxic state of our information environments. We can work together to develop new critical habits like fact-checking and bot-spotting to raise our awareness of the influence of algorithms in our information spaces. Ultimately, however, Amy suggests that to reclaim the web we are going to have to place more pressure on platforms to change policies. The commercial platforms will not make moves to change until they see an impact on their bottom line. The Digital Fluencies Series investigates what it means to develop more critical facility with digital technologies. Faculty, students, and staff are all welcome to participate regardless of digital skills. Learn more about the series at go/digitalfluencies. This entry was posted in Midd Blogosphere and tagged For Faculty, For Staff, Midd Points, Midd/MIIS Collaboration on December 11, 2018 by Bob Cole. On Monday, December 3rd, DLINQ welcomed Dr. Bonnie Stewart for our forth Teaching Online and Hybrid Conversation Series session, Building a Community of Learners Online. Dr Stewart is an Assistant Professor of Online Pedagogy and Workplace Learning at the University of Windsor, Ontario. In her research, she investigates how knowledge, power, and technology intersect with and impact education. Stewart led an engaging conversation with Middlebury faculty and staff about participatory learning, sharing frameworks and strategies we can use to design and foster online spaces that are true learning communities. For those unable to join the discussion, we recorded introductory remarks as well as Dr. Stewart’s slideshow that helped to frame the discussion. This video, as well as notes captured from the session (which include links to resources), may be accessed on the Teaching Hybrid & Online Initiative page on the DLINQ website. As the end of term approaches, stay tuned for announcements of more sessions and other DLINQ events planned for next year. If there is a specific topic about teaching and learning online that you think should be included in the series, let us know! Heather Stafford continues her blog series to dig deeper into some of the small moves that were discussed during her October 25th online workshop ‘Student-Centered Course Design Using Canvas.’ In the series Heather shares activities and design elements that faculty can implement to amplify connectivity of a class. In the third edition of the series, Heather features the use of the ungraded survey in Canvas as a tool for collecting learner feedback at different stages of a class to help inform adjustments to teaching. Keep an eye out for future posts in the series in coming weeks. This entry was posted in Midd Blogosphere and tagged For Faculty, For Staff, Midd Points, Midd/MIIS Collaboration on December 4, 2018 by Bob Cole. Heather Stafford continues her blog series to dig deeper into some of the small moves that were discussed during her October 25th online workshop ‘Student-Centered Course Design Using Canvas.’ In the series Heather shares activities and design elements that faculty can implement to amplify connectivity of a class. In the second edition of the series, Heather features the use of multimedia and interactive discussion tools in Canvas to build social capital among and with students. Keep an eye out for future posts in the series in coming weeks. As Middlebury Institute’s User Experience Librarian, Kristen Cardoso is passionate about improving learning experience for graduate students in Monterey. With the Institute moving towards developing more hybrid and online short-term programs, Kristen and her colleagues have begun thinking about how the Institute’s library could best serve students who may be away from campus. She notes, “…my colleagues and I have done a lot to improve the library’s physical spaces for students; however, our user experience work with regards to the library’s digital spaces have been mostly limited to our website and the library catalog.” Library staff help students through email and over the phone (and very rarely, even through their Facebook page). To transform Library services, she adds “…we knew we were going to have to find a way to provide online the warm, welcoming, and personal service that we currently offer in person.” After discussing the idea and the platform requirement for having librarians embedded into Canvas courses with Bob Cole, Kristen agreed to run a mini-pilot with the two sections of EDUC 8510: Educational Research Methods, currently being taught by Netta Avineri and Deniz Ortactepe. The pilot started about mid-way through the semester, but so far, the results are encouraging. Kristen began by posting an announcement in one section’s Canvas site and posting to the discussion board in the other, and then sending out an email through Canvas to everyone in both sections. Kristen also posted a brief instructional video and created a Library Resources & Tips folder. Acknowledging the positive response to her virtual presence in the courses, Kristen reports that “several students responded to my presence in Canvas, although most of them chose to come and see me in person for help! I’ve helped several students with APA formatting, using our databases, and writing a literature review.” After checking in with the professors, they decided there would be value to also visit the class in-person. This connection led to good discussions about open access publishing and citing sources using tools like Zotero. In the future, Kristen thinks that embedding librarians into Canvas courses from the beginning of the term could be really beneficial and create opportunities for librarians to connect with students taking classes in Monterey or remotely. Inspired by DLINQ’s recent Teaching Online & Hybrid conversation series event on humanizing online learning, one idea Kristen would recommend to further establish librarian presence would be the addition of a personal, introductory video so students can get to know her. This entry was posted in Midd Blogosphere and tagged For Faculty, For Staff, Midd Points, Midd/MIIS Collaboration on November 27, 2018 by Bob Cole. This entry was posted in Midd Blogosphere and tagged For Faculty, For Staff, Midd Points, Midd/MIIS Collaboration on November 20, 2018 by Bob Cole.